In the midst of all of the planning and organizing, your most important responsibility as the Maid of Honor is to maintain yourself as a supportive role to the bride. The Maid of Honor is one of the most important people in the wedding. More than anything else, it is your job to be a good friend to the bride. You are her "right-hand-woman." Your actions and attitude make a huge difference in the bride's experience at the wedding, and ultimately her marriage. See our page "The Bride" for some things to keep in mind during the wedding process. First and foremost, the Maid of Honor should always be a good friend to the bride. Never ever forget this. When it comes to the wedding, this may mean zipping your lip at times. At other times, it is important to speak truthfully. A good Maid of Honor should know the difference and how to best communicate with the bride without upsetting her. 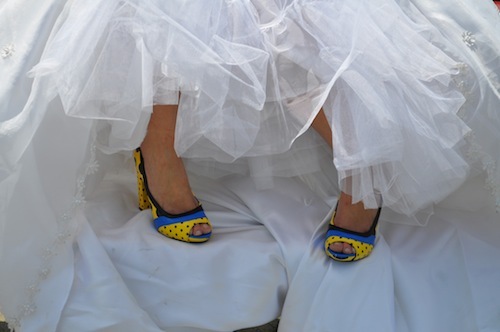 If the bride obsesses over issues, allow her to do so but still be a voice of reason. The Maid of Honor should be familiar with wedding etiquette and traditions so she can properly advise the bride. Find out about her family's traditions as well as what the groom's family will expect to see. The more that can be addresses ahead of time, the less problems are likely to rise. Help make sure the bride has privacy if she needs it. This could be during any time of the wedding planning process, all the way to the time you help her send thank you cards. Getting married can be stressful and being surrounded by people you love is not always the best thing. Sometimes, she might even want you to leave her alone! You should respect this and give the bride her personal, quiet time. The Maid of Honor should be able to know the times to get silly and be a source of laughter and humor for the bride. The more she laughs, the less she will need to get angry and vent. Bachelorette.com is a great place to shop and see different bachelorette party ideas. I have worked on some other sites: CanyPenis.com is a review of different candy penises, BachelorettePartyFashion.com gives you some bachelorette party fashion tips, BachelorettePartyPlaylist.com suggests some fun girl-power music for the event. PenisCandy.com is sorta like CandyPenis.com but backward. BlackBachelorettePartySupplies.com is a great site that points out the options available for black bachelorettes. I also worked on BachelorettePartyMusic.com, DickHeadHoopla.com, CuteBacheloretteParty.com and GamesforBacheloretteParties.com.